Role: To improve local children’s football skills and techniques. Football is the national sport in Ghana. Given the 'Black Stars' - the Ghanaian team's - successful performance in the 2010 World Cup, football in Ghana can only continue to get bigger and better. Football in Ghana is everywhere! Whether football flags on cars, stickers in taxis, locals in football jerseys or kids playing in the street, it is immediately apparent that Ghanaians are extremely passionate about football. 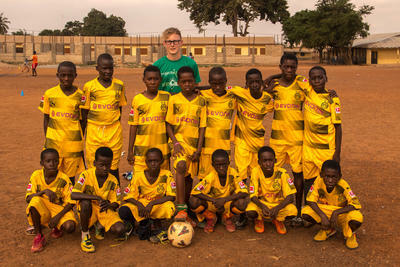 Our football placements in Ghana provide an opportunity for all young players to develop their basic skills and techniques with the hope that some may achieve the success of Premiership stars Michael Essien or Stephen Appiah. There will also be the opportunity to see one of Ghana's many top division club teams - like Kotoko and Hearts of Oak - in action. 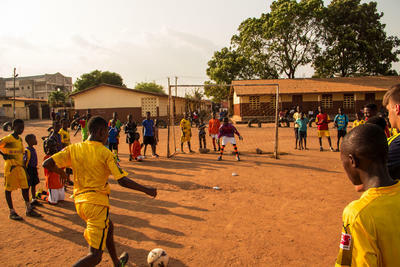 Volunteers sometimes take young players to games to help with their footballing development and to provide a well-earned break from their sport coaching. By joining the Football project, first-time Projects Abroad football-coaching volunteers have the opportunity to get involved in all aspects of a youth academy. Volunteers will take part in the morning meeting with the local coaches to prepare the training session, do match analysis and discuss the weekly schedule. In the afternoons they will work with a youth team, giving them the benefit of their newly acquired coaching knowledge and skills. This project is a fantastic chance to improve your skills and ability whilst also helping local children to develop their game. If you are good enough you may even be selected to play for one of the local third division teams in one of their friendly games! Volunteers with more experience, those holding a Football Association Coaching certificate for instance, will be able to assist the coaches in training the senior team. During your time coaching football in the afternoons you will be responsible for the development of young footballers' basic skills and techniques. You will co-ordinate coaching sessions around topics such as development of ball control, accurate passing, keeping possession, game tactics and moving into space. Furthermore you will help the coaches to plan match strategies and take practice games. You will probably be asked to assist in team selection and may even be required to be 'on the bench' for weekend or evening matches. You can join the Football project in Ghana for one, two or three weeks if you don't have time to join us for four weeks or more. This project has been selected by our local colleagues as being suitable for short term volunteering for both the host community and the volunteer Although you will gain a valuable cultural insight and work within the local community please be aware that you may not be able to make the same impact as someone volunteering for a longer period.